Ron Bresolin Jr. began his career in the San Francisco Bay Area where he worked in the tax department for “Big 8” firms Arthur Andersen and Deloitte & Touche. Next Ron served as Tax Compliance Manager for URS Consultants, a publicly traded company. 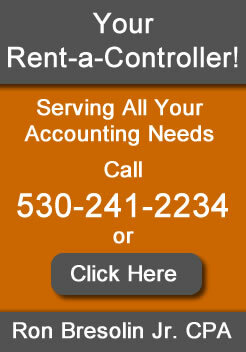 In 1990 Ron returned to his hometown of Redding and resumed practicing Public Accounting. Ron holds an MS degree in taxation and a B.S in business administration. Ron is experienced in tax planning for family owned businesses and their owners as well as litigation support (lost income, insurance defense, family law). Gail Shook moved from Southern California to Redding in 1986. In Southern California she was CFO for a worldwide company involved in manufacturing, importing, exporting, distributing and retail. Gail has over 30+ year’s business experience as a controller and CFO. She has a broad range of successful accounting experience in manufacturing, medical, automotive, construction, not-for-profit, turn around and entrepreneurial environments. Locally, Gail was the Plant Controller for Knauf Insulation for 8 years. She spent the 6 previous years as Business Specialist Manager for the Economic Development Corporation of Shasta County, responsible for such programs as their Shasta 2001, Business Retention/Expansion, State Enterprise Zone program, & local business liaison to the community. Our experienced staff can provide you with personal and professional service, including tax compliance and planning, accounting services, financial statement preparation, small business consulting, and Quickbooks setup, training and support.